Children are natural artists. To express this innate ability all they need is an environment that offers them the proper materials in combination with clear demonstrations using the various art processes.The art process is valuable as an experience and expression in itself. Children love process and the exploration of various media, often to the extent that the finished work is merely a by-product. As with other Montessori work, the emphasis is on process and we begin with the most basic processes and progress to the more complex. 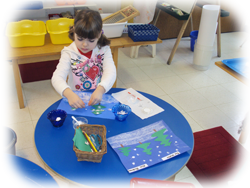 Art is integrated into all the areas of the Montessori classroom. One of the earliest Language activities is illustrating the child’s own stories- at first by drawing pictures, and later by illustrating their written words. The Geometric Insets teach the shapes and prepare the eye and hand for writing while making lines and creating designs. Other language work, such as Parts of a Paintbrush, names and labels things and their parts. In Math we illustrate our monthly calendar and make our own illustrated number books. 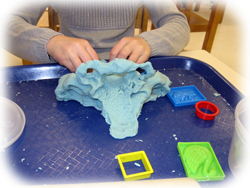 Geography work includes drawing or painting maps, making play dough continent maps, and later, detailed clay relief maps. We learn about other countries and cultures by exploring their art. Color theory, geometric shapes and visual relationships are explored with the Color Boxes, Constructive Triangle Boxes, and Geometric Cabinet in the Sensorial area. Children become familiar with famous artists by matching, identifying, and categorizing their works. Practical Life work includes life skills such as squeezing and using a sponge, carrying a bucket, using a water source, mixing colors and making a color wheel with colored water. With the Practical Life exercises children learn how to focus and carry out a complete process in sequential steps from beginning to end. A step-by-step demonstration is given for art processes such as dipping a paintbrush, washing a brush, gluing, washing a glue lid and glue brush. Art is also intermingled with the various studies in the classroom with theme-related work such as Solar System Resist Painting and Tissue Transfer Butterfly Wings. In the Art area a selection of basic art materials such as crayons, markers, colored pencils, paint and easel, scissors, paper, and glue are always available for free exploration and self expression. A lesson is given on proper use of the materials, but then allowing each child to use his or her own creativity and imagination.